During 2016’s US presidential race, Latinos for Trump founder Marco Gutierrez referenced his Mexican heritage saying, “My culture is a very dominant one … it's causing problems. 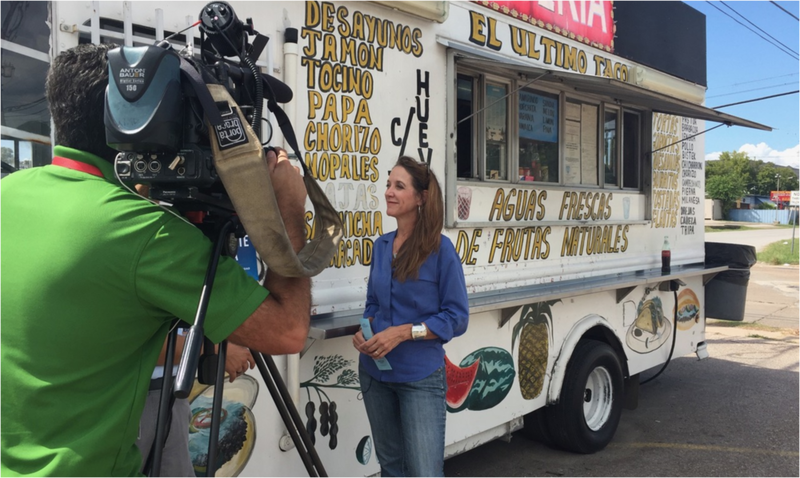 If you don’t do something about it you could have taco trucks on every corner.” The barb spurred Rigsby Hull to get busy turning Houston taco trucks into voter registration booths. Why? Texas has low turnout at the polls—dead last among the 50 states—and fewer than a quarter of eligible Texas Latinos even register to vote. Comprising 5 million mostly disengaged voters in Texas and 22 million more nationwide, the Hispanic community has been called America's "political sleeping giant”. With immigration issues featuring prominently, we figured an awakening is at hand and that tacos might help fuel it. Our project, partnered with Mi Familia Vota, went wildly viral, with global coverage in NYTimes, ABC and CBS News, NPR, Fox News, Reuters, Washington Post, Texas Monthly, Houston Chronicle, Times of India, French news journal Kobini, Australian Broadcasting Corp, Voice of America, and many others. Houston Chronicle reported that the effort “...is a trend that prompted Harris County Clerk Stan Stanart to call a news conference Wednesday, just a few blocks from the Tacos Tierra Caliente truck, encouraging people to vote early to avoid the crowds.” Registrations poured in. Ultimately, nearly 324,000 new voters registered—breaking Texas and Harris County records—with Hispanic surnames accounting leading the increase by a wide margin. NPR News wrote that taco trucks “now straddle the worlds of political symbol and internet meme”. What better way to fuel a democracy? Find our “Taco Trucks on Every Corner” project in the newly-released Social Science/Law textbook, Keeping the Republic, by Barbour & Wright. The book’s stated aim, “teaching students to think critically about American politics—exploring who gets what, and how, and the twin themes of power and citizenship”, is one we wholeheartedly support.